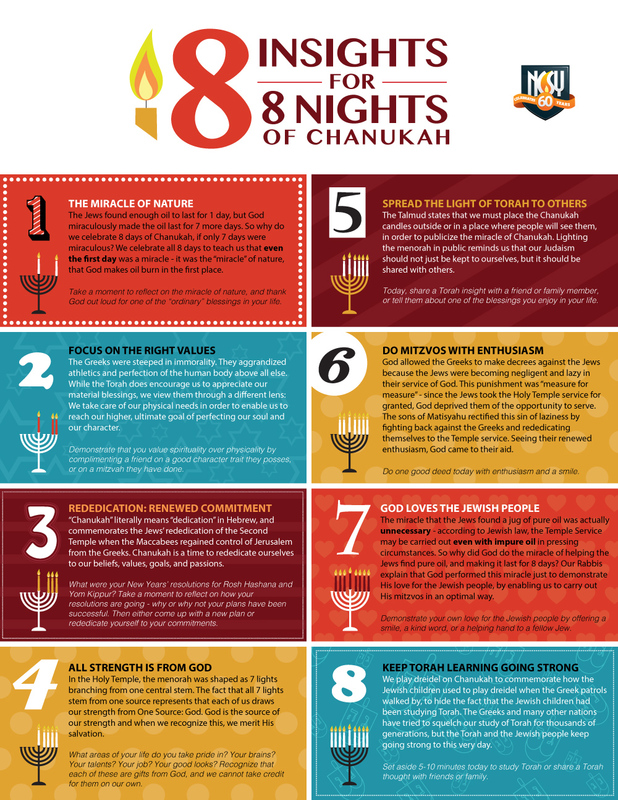 8 insights for the 8 nights of Chanukah, with practical and relevant take-aways. The Jews found enough oil to last for 1 day, but God miraculously made the oil last for 7 more days. So why do we celebrate 8 days of Chanukah, if only 7 days were miraculous? We celebrate all 8 days to teach us that even the first day was a miracle - it was the “miracle” of nature, that God makes oil burn in the first place. Take a moment to reflect on the miracle of nature, and thank God out loud for one of the “ordinary” blessings in your life. The Greeks were steeped in immorality. They aggrandized athletics and perfection of the human body above all else. While the Torah does encourage us to appreciate our material blessings, we view them through a different lens: We take care of our physical needs in order to enable us to reach our higher, ultimate goal of perfecting our soul and our character. Demonstrate that you value spirituality over physicality by complimenting a friend on a good character trait they posses, or on a mitzvah they have done. “Chanukah” literally means “dedication” in Hebrew, and commemorates the Jews’ rededication of the Second Temple when the Maccabees regained control of Jerusalem from the Greeks. Chanukah is a time to rededicate ourselves to our beliefs, values, goals, and passions. What were your New Years’ resolutions for Rosh Hashana and Yom Kippur? Take a moment to reflect on how your resolutions are going - why or why not your plans have been successful. Then either come up with a new plan or rededicate yourself to your commitments. In the Holy Temple, the menorah was shaped as 7 lights branching from one central stem. The fact that all 7 lights stem from one source represents that each of us draws our strength from One Source: God. God is the source of our strength and when we recognize this, we merit His salvation. What areas of your life do you take pride in? Your brains? Your talents? Your job? Your good looks? Recognize that each of these are gifts from God, and we cannot take credit for them on our own. The Talmud states that we must place the Chanukah candles outside or in a place where people will see them, in order to publicize the miracle of Chanukah. Lighting the menorah in public reminds us that our Judaism should not just be kept to ourselves, but it should be shared with others. Today, share a Torah insight with a friend or family member, or tell them about one of the blessings you enjoy in your life. God allowed the Greeks to make decrees against the Jews because the Jews were becoming negligent and lazy in their service of God. This punishment was “measure for measure” - since the Jews took the Holy Temple service for granted, God deprived them of the opportunity to serve. The sons of Matisyahu rectified this sin of laziness by fighting back against the Greeks and rededicating themselves to the Temple service. Seeing their renewed enthusiasm, God came to their aid. Do one good deed today with enthusiasm and a smile. The miracle that the Jews found a jug of pure oil was actually unnecessary - according to Jewish law, the Temple Service may be carried out even with impure oil in pressing circumstances. So why did God do the miracle of helping the Jews find pure oil, and making it last for 8 days? Our Rabbis explain that God performed this miracle just to demonstrate His love for the Jewish people, by enabling us to carry out His mitzvos in an optimal way. Demonstrate your own love for the Jewish people by offering a smile, a kind word, or a helping hand to a fellow Jew. We play dreidel on Chanukah to commemorate how the Jewish children used to play dreidel when the Greek patrols walked by, to hide the fact that the Jewish children had been studying Torah. The Greeks and many other nations have tried to squelch our study of Torah for thousands of generations, but the Torah and the Jewish people keep going strong to this very day. Set aside 5-10 minutes today to study Torah or share a Torah thought with friends or family.